The Quietcast: Don Coscarelli Talks PHANTASM Remaster! 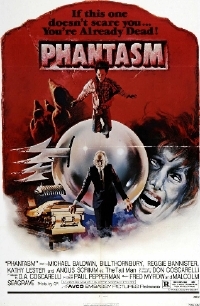 Don Coscarelli's 1979 horror film Phantasm has a legion of loyal fans but, until late last year, no one would have suspected that one of its biggest was mega-producer J.J. Abrams. In fact the director of Star Wars: The Force Awakens is such a fan that his company, Bad Robot, took on the arduous task of restoring the film's picture and audio for a new 4K remastered edition. This pristine new print will have its theatrical premier at SXSW on Monday, March 14. The screening will, of course, be a midnight one. To talk about all this and revisit the legacy that is Phantasm, we got Coscarelli on the line. We also talk about the fifth film in the series, Phantasm: Ravager, which we expect is being released later in 2016. For the first time, we also asked a guest some questions we got from readers on Twitter. This is something we'll keep doing, so watch for requests for questions for guests in the future by following that account. Here's the trailer, a part of which is sampled above.